George Lucas adopted a new mantra: 'It's only a movie, it's only a movie, it's only a movie.' And he's right. It'll certainly do for a Friday night. But to...fans, the 1980s films are more than movies. 123 min. Paramount Pictures. Director: Steven Spielberg. Cast: Harrison Ford, Shia LaBeouf, Karen Allen, Ray Winstone, John Hurt, Cate Blanchett. In promoting Indiana Jones and the Kingdom of the Crystal Skull, executive producer and story man George Lucas adopted a new mantra: "It's only a movie, it's only a movie, it's only a movie." And he's right. It'll certainly do for a Friday night. But to Indiana Jones fans, the 1980s films are more than movies—they are sacred texts of action cinema blessed with one of the most beloved heroes in American culture. In other words, those who agree with the latter statement should moderate their expectations. The latest entry opens with a burst of energy in the desert prairie of 1957 Nevada. Here, where what you see is real, and a reminder of Spielberg's phenomenal skill with camera and geography. With Elvis' "Hound Dog" blaring on the soundtrack, rubber meets the road: the director strongly conveys movement with fast vehicles, crane shots and the like. Indiana Jones movies always have a lot of impressive stunts, but this stunt is pure Spielberg, because nothing to speak of happens during this title sequence. Nothing, that is, except the effective priming of the audience, which is enough. When Spielberg later applies similar techniques to a motorcycle chase and even a computer-assisted jungle chase, the picture leaps to life. As a caravan of military vehicles reaches its destination, we reacquaint ourselves with Dr. Jones, meet his British sidekick Mac (Ray Winstone), and learn what's in the fabled Hangar 51. What's there is of vital interest to Russian agent Irina Spalko (Cate Blanchett), an ice queen once known as "Stalin's fair-haired girl" despite her jet-black bob. Soon, the chase is on, with Indy running for his life from the Russians and worse, the wages of the atomic age. A sequence that evokes the mushroom-cloud fears of the 1950s incorporates a mocking mock-up of suburbia in Technicolor pastels out of a Douglas Sirk picture (could it be a preemptive visual pun about the threat of Jones settling into a "nuclear family"?). And though years have passed since McCarthy's Senate censure, Indy gets debriefed by FBI agents who wonder openly if he's true blue or Red. As Indy's college dean (Jim Broadbent) points out, "I barely recognize this country anymore." Broadbent's Charles Stanforth—heir to Denholm Elliott's Marcus Brody—is mostly on hand to deliver the key line "We seem to have reached the age when life stops giving us things and starts taking them away." Naturally, that depressive anti-sentiment turns out to be 180 degrees from the truth: despite the ravages of age and the passage of important people from his life, Indy will discover how much he has to gain as his twilight years approach. For a start, Dr. Jones once more gets news that calls for packing away his bespectacled professor persona and donning fedora, leather jacket, and whip. Like it or not, he gets a new partner in a motorcycle punk named Mutt Williams (Shia LaBeouf) and a new quest for an ancient relic of supposed supernatural provenance: a Crystal Skull. In terms of tone, the picture is a hybrid of the comic-book exaggeration of Temple of Doom and the comic domestic squabbling of The Last Crusade. Ironically, the picture least resembles Raiders of the Lost Ark, though Marion (Karen Allen) returns to get Jones' engine running with argumentative ardor. The whole picture feels just a bit out of step with the previous films, a problem felt as well in Ford's performance. Hit-and-miss screenwriter David Koepp (Spider-Man, War of the Worlds) has Indy preoccupied with sadness over what he's lost one minute, reconnecting with his growly anger the next, and inorganically wisecracking through it all (story credit goes to Lucas and Jeff Nathanson). Ford and the picture hit their stride when Indy takes to the jungle with Marion, Mutt, and loony Professor Oxley (John Hurt) in a series of scenes that sends Indy aggressively off-balance with personal fears, personal reckoning, and, for good measure, fights performed on speeding vehicles. 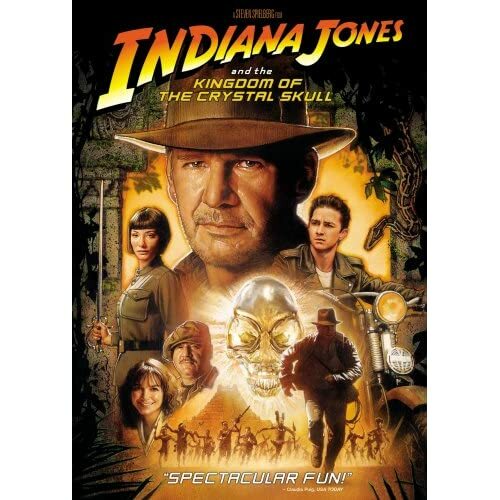 The archaeological mysteries have never been more convoluted (in this way, Koepp's script is too smart for its own good), and like so many sequels before it, The Kingdom of the Crystal Skull suffers from pacing that renders a surfeit of characters unknowable through screenwriting shorthand. Winstone plays a plot device, not a character, and his tendency to holler "Jonesy!" becomes nearly as annoying as Jar Jar Binks; Blanchett's character never sparks, either. Allen and LaBeouf fare much better, though they both feel underserved as characters. The idea of belief is a core theme, though it's paid off in hackneyed fashion, as is the now-tired Indy theme of artifact-grubbing greed (and still no acknowledgement that Indy's committing the worst archeological crimes this side of Heinrich Schliemann). As for the thrust of the plot, built on the Crystal Skull MacGuffin, it trips past the line so winningly toed in the previous three films—part and parcel, I suppose, of a post-CGI Indiana Jones picture. Despite assurances to the contrary in promotional interviews, the fourth Indy film sports an awful lot of digital paint work. Yes, the stunt work is typically great, and yes, you'll be asking yourself, "How'd they do that?" at some of the composites that allow the actors to appear to defy death (the answer's in the reported $185 million budget, spent largely in the halls of ILM), but the CGI helps to send Kingdom of the Crystal Skull to the back of the line of Indy films. That said, this is an Indiana Jones picture. Starring Harrison Ford and Karen Allen. And that LaBeouf kid ain't bad either—good enough, in fact, to inspire lots of sequel rumors that look yet more plausible after seeing the film. Whether with Ford, LaBeouf, or someone else decades down the line, the aging Indy franchise is likely to keep on giving things rather than taking them away—it's the nature of Hollywood business in the 21st century. As for Indiana Jones and the Kingdom of the Crystal Skull, yes, it's only a movie, but I hear people like movies. Just remember: it's not the second coming, but the fourth. 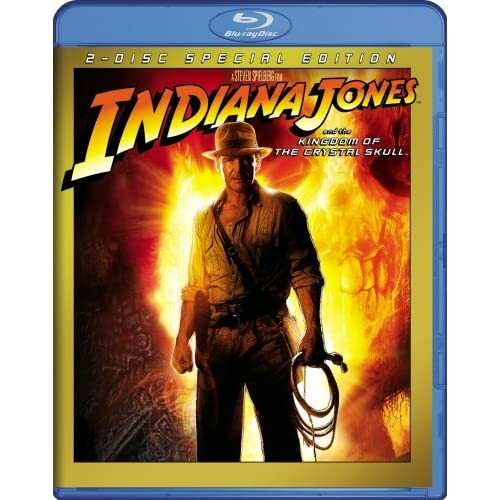 Paramount and Lucasfilm give the fans what they want in a spectacular 2-Disc Blu-ray edition of Indiana Jones and the Kingdom of the Crystal Skull (mirrored in a 2-Disc DVD set). The Blu-ray shines with a picture-perfect transfer. Perhaps a little too perfect: the film's extensive post-production scrubbing, toning, and effects work result in an image that never seems very natural or film-like (grain is absent), but the Blu-ray provides a sharp rendering of the film that matches my memory of how it looked in theaters. The reference quality Dolby TrueHD 5.1 surround track likewise does the original material justice with a thrilling, discrete balance of effects, dialogue, and John Williams' signature music. Disc One also hosts the first of several features produced by Laurent Bouzereau: "The Return of a Legend" (17:34), an overview of the franchise's revival that includes comments from Steven Spielberg, Harrison Ford, George Lucas, producer Frank Marshall, screenwriter David Koepp, executive producer Kathleen Kennedy, Karen Allen and Shia LaBeouf. A featurette focused on "Pre-Production" (11:44) adds the insights of pre-visualization supervisor Daniel D. Gregoire, DP Janusz Kaminski, and Ford's costume designer Bernie Pollack. Disc One wraps up with "Theatrical Trailer 2" (1:52) and "Theatrical Trailer 3" (1:55)--was "Theatrical Trailer 1" never released? Disc Two's centerpiece is the feature-length "Production Diary: Making of The Kingdom of the Crystal Skull" (1:20:52). This detailed step-by-step record of the production includes the chapters "Shooting Begins: New Mexico," "Back to School: New Haven, Connecticut," "Welcome to the Jungle: Hilo, Hawaii," "On-Set Action," "Exploring Akator," and "Wrapping Up!" Joining the ranks of interviewees are the balance of the cast, the rest of the design team, and a significant representation of the crew, fro snake handlers to makeup artists. Six additional featurettes further highlight the top-to-bottom contributions of the crew. "Warrior Makeup" (5:34) explains the intricate makeup design and application process for the native warriors. "The Crystal Skulls" (10:10) regards the myth, historical provenance, and production design element that is the Crystal Skull. "Iconic Props" allows prop master Doug Harlocker to give us a tour of the latest additions to the Lucasfilm archives. "The Effects of Indy" (22:42) and "Adventures in Post-Production" (12:44) are fairly self-explanatory, though the latter includes among its subjects a few living legends: editor Michael Kahn, sound designer Ben Burtt, and composer John Williams. "Closing: Team Indy" (3:41) has Spielberg introduce a montage salute to crew and cast. The pre-vis glimpsed in the featurettes gets its closeup in three Pre-Visualization Sequences: "Area 51 Escape" (3:51), "Jungle Chase" (5:47), and "Ants Attack" (4:29). Last up are multiple Galleries for The Art Department and Stan Winston Studio, as well as galleries of Production Photographs and Behind-the-Scenes Photographs. Indy fans will not be able to resist this lovingly assembled, beautifully presented Blu-ray set. All site content © 2000-2019 Peter Canavese. Page generated at 04/17/2019 04:01:52PM.